Willie the Bear was found in a Virginia Animal Shelter after being taken from a neglectful house. He came to Maryland and started enjoying life in 1997. Lauralee thought that Obedience at Oriole would be a good thing for her and Willie. And he did very well and earned his CD in 4 shows. However, their Obedience instructor thought that he would make a good Flyball dog. So, she suggested they come out on Friday night and see what Flyball was all about. 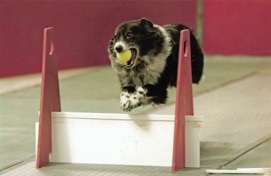 And 6 months later, Willie was doing Flyball demos with No Speed Limit. And he earned his FD in September of 1998. Though he wasn’t the fastest of dogs, he was steady and very reliable. So much so, that when Lauralee got married, her husband Dave got hooked on the sport by running Willie. Dave and Willie went on to earn Willie’s Onyx, Flyball Grand Champion, and his FGDCh 40K. He helped train many new dogs and some new handlers as well. 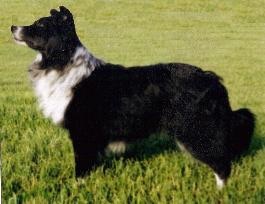 He retired from Flyball tourneys in 2007. 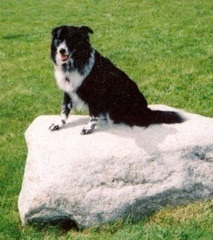 And finally retired from training the newbies in 2008 at the grand old age of 16.